Have you ever wondered why most heroes only come out at night. Cuz it’s harder to see bright colors under street lights? The context says villain-of-the-issue… the outfit/working hours says ‘pimp’. Nothing says “Miller Time” like a five knuckle shuffle. 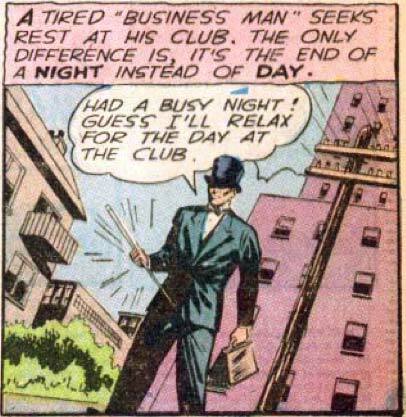 Was it common for “business men” to wear top hats and carry canes in 1942? I hope nobody bumps into his cane! OUCH!